Georgia Law regrets to announce the passing of Professor and Law Library Director Emeritus Erwin C. Surrency (J.D. 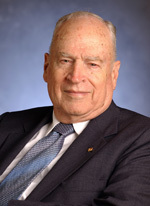 '48), who served as a faculty member at the law school from 1979-1994. During his time at Georgia Law, Surrency made many contributions and efforts to improve the law library and establish relationships with local legal communities. He also served as president of the American Association of Law Librarians, was a founding member of the American Society for Legal History and was a founding editor of the American Journal of Legal History. This past year, Surrency was also inducted into the AALL Hall of Fame. Surrency passed away on Nov. 8 and is survived by his wife, Ida Winn Surrency, and his two children, Robert and Ellen. Please send your fond memories and condolences via e-mail to: cindyh@uga.edu. We will post selected e-mails to this Web page so all can share in the memory of this highly respected scholar and friend. The imprint which Erwin Surrency made on his profession is remarkable. He loved libraries and he loved books, and Erwin revered the historical foundations upon which law is built. Over the many lunches we enjoyed together, he delighted in explaining the fine points of legal history. I am glad his outstanding service was recognized in important ways during his lifetime, including induction into the American Association of Law Libraries Hall of Fame. Erwin’s integrity was of the highest order, and his dedication to his family and profession admirable. He will be remembered as a true scholar and a treasured friend. Prof. Surrency was the Director of UGA’s Law Library from 1980 to 1995. Prior to his time here at UGA, he served as Director of Temple University’s Law Library from 1950 to 1979. I was fortunate to have the benefit of his wisdom gained from 45 years of experience as a law librarian. Even though he retired more than 15 years ago, I still have fellow law librarians approach me at AALL’s national meeting and ask about him. His influence on the law librarian profession will long be remembered. Prof. Erwin Surrency, my good friend, was always a Southern gentleman in the best sense of the term. I cannot count the kindnesses he did for me (including locating several missing books of mine which had been lost for months and he found on a shelf in the law library where I had inadvertently left them). Many times we had lunch together at the Mayflower Restaurant and talked legal history, a topic we both loved. Here was scholar, I would think when we conversed, who was researching and writing on a wide variety of legal history topics when I was barely teenager. Only recently did I actually obtain a complete bibliography of Prof. Surrency’s writings and realize just how many books, articles, and book reviews the man had written and the comprehensive range of topics he had mastered. The amount and quality of his scholarly writing is stupefying. In April 2014 the American Journal of Legal History, which he founded, will put out a special memorial issue dedicated to Prof. Surrency. I am proud and pleased that the issue will include a legal history article which I researched in the House of Lords Record Office in Palace of Westminster in London, England. In order to pleasantly surprise him, he was not told about the preparation of the special issue (which originally was to be a commemorative issue, not a memorial issue). I deeply regret that Prof. Surrency never knew about the issue or about my article being in it. But perhaps he does now know, looking down from the glories of Heaven.